1. 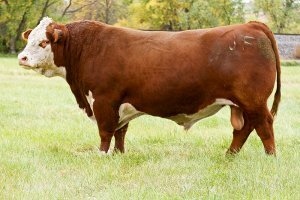 A Hereford 11-trait leader, breed leading genetics with extra style. 2. Good pigment, shape, eye appeal and balance. 3. His daughters have good milk and have done a great job across the country. Powerful sons are equal in demand. Five years of calf crops Avg BW 86lbs. 4. Trust's dam is backed by a cow family known for superb udders and ability to produce at the top every year.